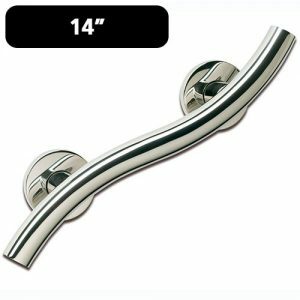 Stainless Steel Curved Grab Rail – 350mm. Crosshead Tap Turners – Pair. These strong moulded plastic tap turners represent excellent value for money and have been designed to make it easier to turn crosshead taps on or off. Very easy to use, the tap turners simply hook over the top of any X type tap, giving the user extra leverage and making the taps easier to turn. 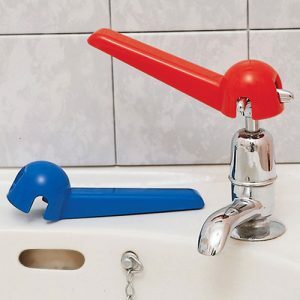 Ideal for users with a weak or painful grip, such as those suffering from arthritis, the Crosshead Tap Turners is supplied as a pair, with one Blue and one Red turner to ensure that hot and cold taps are easily identifiable. The Foot Cleaner Mat is a multi-functional bathing aid that promotes both personal hygiene and safety. At the front of the mat is an oval area fitted with raised nylon bristles that enables the user to scrub his or her feet without the need to bend, crouch or kneel. The rest of the Foot Cleaner Mat is heavily textured with raised circular bumps, which are specially designed to massage the feet and promote blood flow. Thanks to the small suction cups on the underside of the Foot Cleaner Mat, it will stay securely in place, whether used in the bath, shower or on the bathroom floor. 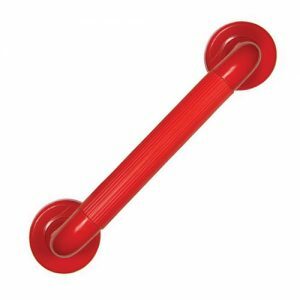 The Long Handled Back Washer has been specifically designed to make it easier to reach and wash the back. The long curved design provides a carefully balanced back washer that can reach all of the back and can be used with minimal effort for maximum power and effectiveness. This ensures full coverage of the back area without the need to over-stretch or strain. The oval shaped handle of the Long Handled Back Washer features a two hand grip with non-slip material ensuring the best grip even when wet. The wash cloths on the end of the back washer do not absorb water so remain light at all times and are machine washable for the utmost hygiene. Spares can also be found in this section of the shop. The Long Handled Body Washer has been designed to make it easier to reach and wash the body. The ergonomic design provides a carefully balanced body washer that can be used with minimal effort to avoid over-stretching and straining but with maximum power and effectiveness. The long handle of the Long Handled Body Washer is oval shaped and made with a non-slip material ensuring a secure grip even when wet. The wash cloths do not absorb water so will remain light at all times making it extremely easy for the user to wash their body. 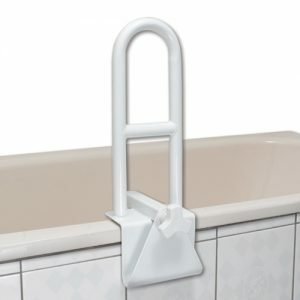 The deluxe bath grab bar safety rail provides a firm handle on the bath side that helps give users confidence and provides a stable aid to assist when getting into and out of the bath. The white coated steel rail fixes easily but very securely to the side of the bath using its high-quality clamp, the inside of which has rubber padding to prevent any marking of the bath as well as improving stability. This easy fitting system also ensures that the rail can be quickly and easily repositioned to provide maximum assistance and comfort for more than one user, or removed completely or easy storage or transportation when not required. The bath rail can be used on metal, stone or fibreglass baths whose sides range in thickness between 75mm and 180mm (3″ to 7″). 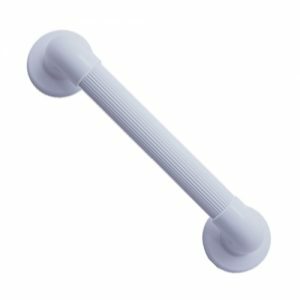 Plastic Fluted Grab Rail – 300mm.